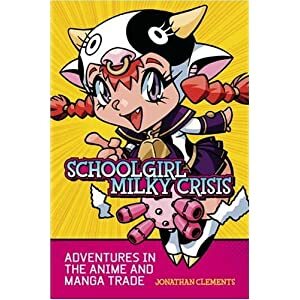 It has come to my attention that the Kindle version of Schoolgirl Milky Crisis omits the book’s infamous index. Oh, all you digipeople are so smart with your searchy buttons, you think you don’t need an index! Well, the SMC index was my little tribute to Joe Queenan and came in for particular praise from many reviewers… and hopefully not because it just meant that the book was almost over. Here it is in full. 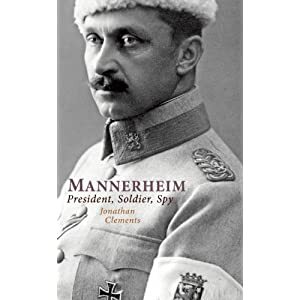 From Mannerheim: President, Soldier, Spy by Jonathan Clements, available now in the UK and in the US. Mannerheim began his eighties still talking of responsibility and struggle. As he saw it, Finland still ran the risk of drifting irrevocably too far to the left, and he was determined to hold this off by the last means available to him – writing his memoirs. His decision was unsurprising, but also unwelcome to some of his successors. Mannerheim’s avowed intent was to educate the Cold War world about recent Finnish history, but his memoirs were sure to attract the attention of readers back home. President Paasikivi, in particular, fretted that his illustrious predecessor would write a tell-all book that was sure to land Finland in hot water with the Soviet Union, with which relations were still strained. Mannerheim did exactly as Paasikivi had feared but was steered into being less forceful in his published comments on Bolshevism and ‘Reds’, and also in his attitude towards the Swedes. In private, Paasikivi grumbled that if he paid heed to every one of the field marshal’s grim warnings then everyone in Finland might as well walk into the forest with a pistol and shoot themselves in the forehead. Despite the politicians’ concerns, Mannerheim was left to write his memoirs in peace with the help of a small staff of assistants. He seems to have originally planned on doing so in Kirkniemi, a manor house he had bought in what is now the Helsinki suburbs, but continued ill health lured him out of Finland to Switzerland in the late 1940s. ‘If on this earth there is a place to be found which is dedicated to forgetting,’ he wrote to a friend, ‘it is Switzerland, with all the convenience which makes life easy, hotels, communications, order, food and the beauty of the landscape, but above all, the mountains, the Alps which give the impression of being somewhere in the atmosphere, above the clouds, between earth and sky.’ Mannerheim also observed that Switzerland, unlike so many other parts of Europe, had been spared the damage and destruction of the war – it was, in many ways for him, a reminder of the lost Europe of his younger days. His circle of true friends, always small, dwindled predictably in old age. ‘I begin to see only graves around me,’ he commented, although his dry melancholy was economical with the truth. In fact, he spent much time in the company of a new lady companion, the elegant Countess Gertrud Arco-Valley. Some 30 years his junior, the divorcee countess was a friend of Mannerheim’s younger daughter and was often seen accompanying him on his travels. Mannerheim spent increasing amounts of time in hospital, troubled in particular by stomach and intestine problems. A perforated ulcer nearly killed him in 1946, and kidney stones and haemorrhages laid him low in 1948. He began to lose weight drastically, and is noticeably thin and frail in the photographs of him at the clinic in Val-Mont, Switzerland, where he both took spa treatments and continued to work on his memoirs. In early 1951, Mannerheim was hospitalised again in Lausanne with a distended abdomen, and had emergency surgery for a blocked intestine. It was, he joked with his surgeon, his last battle, and one that he was likely to lose. He said his goodbyes to those around him on 27 January, and fell into a sleep from which he never awoke. His heart stopped half an hour before midnight, although in Finland’s time zone it was already the following morning – the anniversary of his decisive strike against the Reds in the Finnish Civil War of 1918. A little later than usual, the Public Lending Right sent me last week a statement of the number of times that my books have been taken out of British libraries. As I explained last year, many civilised countries have a scheme like this, whereby authors are reimbursed by the state if libraries loan out their books. This year, my finances are enriched to the tune of 6.25 pence per loan. 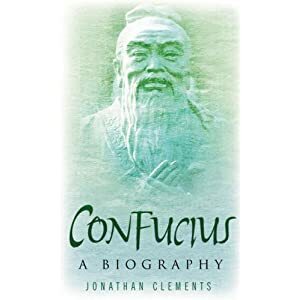 Confucius: A Biography (hardback and paperback combined). Beijing: The Biography of a City. A Brief History of the Vikings. A Brief History of the Samurai. The First Emperor of China (hardback and paperback combined). The Pirate King (in paperback as Coxinga). Regular readers will note that there is a new entry, straight in at the number 6 slot, for a book that was only published a couple of months before the year’s deadline – we can perhaps expect the samurai to go further up the charts next year. Meanwhile, all the manga translations have dropped out — does this mean that Bloomsbury’s Ironfist Chinmi books are finally succumbing to wear and tear after 15 years, or simply that this year’s sampled libraries didn’t have so many comics on their shelves to begin with? Twelve years ago, I wrote a little children’s book under a pseudonym in a matter of days — I think it took me no more than a long weekend. It has since been reprinted several times, by three different English-language publishers, and translated into some very rare languages, including Moldovan and Malay. Ever since, it has consistently generated a full 25% of my annual library royalties. There’s no predicting what book will be the one that makes one’s fortune. Not that this book makes me a fortune, but it puts a smile on my face every year when I discover another legion of people have checked it out of their local library. The latest issue of Salon Futura is up online with a lovely Judith Clute cover, and includes a large review-article from me about Ranpo Edogawa, the “Fiend with Twenty Faces” and the remake thereof, just released in the UK as K20: Legend of the Black Mask. 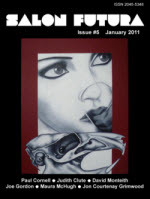 Also in this issue: Paul Cornell interviewed and Paolo Bacigalupi profiled, Judith Clute interviewed, Jon Courtnay Grimwood… interviewed; more interviews than you can shake a stick at. Plus Sam Jordison on Venice, and editor Cheryl Morgan with a rant on “genre”. Online now, an interview with me by Armando Rotondi of the Italian webzine Asia Express, in which we get into imitable violence, the Western canon of Eastern animation, and the threat, or lack thereof presented to Japanese animation by the nascent industries of Korea and China. Also check out their reviews of Schoolgirl Milky Crisis (“un libro esplosivo”), The Anime Encyclopedia (“davvero mirabile in tutto”), and The Dorama Encyclopedia (“un testo essenziale”). In other news, I discover that my second Vikings book is now available in Italian. This article has been moved to the Manga UK Blog.